Taipei, Jan. 17 (CNA) Lawmakers from both the ruling and opposition parties said Thursday they are looking to amend laws in the next legislative session to increase penalties for child abuse, in the wake of a series of recent cases involving physical and psychological abuse toward children, including a shocking case of a 19-month-old baby girl who died from her injuries. Lawmakers, who gathered in the Legislature on Thursday to decide on the opening date for the next legislative session, said they plan to prioritize the passing of law amendments that will prevent and impose heavier punishment for child abuse in the new session, which is set to begin on Feb. 15. Ruling Democratic Progressive Party's (DPP's) legislative caucus whip Ker Chien-ming (柯建銘) said there are currently 16 versions of draft amendments to Article 286 of the Criminal Code, and 14 versions of draft amendments to The Protection of Children and Youths Welfare and Rights Act, adding that his party will prioritize these bills in the new session. One of the draft amendments to the Criminal Code was proposed by the Cabinet, sent to the Legislative Yuan in September last year, and is now waiting to be reviewed by the Judiciary and Organic Laws Committee. Under the draft amendment, the penalty for the abuse of a minor under the age of 16 that results in impaired mental or physical health or development will be at least six months and up to five years in prison. Currently, there is no minimum penalty, but the maximum is also no more than five years in prison. The draft amendment also adds penalties for cases of severe injury and death. In cases of severe injury to a minor as a result of abuse, the penalty will be five to 12 years in prison, and if a child dies as result of abuse, the perpetrator will be subject to a prison sentence of 10 years to life, according to the draft bill. Currently, perpetrators of child abuse are often tried on charges of injury resulting in death instead of on charges of homicide, which carry a heavier sentence. Tseng Ming-chung (曾銘宗), secretary-general of the opposition Kuomintang's legislative caucus, said to speed up the passing of these bills, he suggests submitting these bills directly to cross-party negotiations instead of legislative committee reviews. People First Party caucus whip Chou Chen Hsiu-hsia (周陳秀霞) pointed out that besides amending laws, it was also important to improve social safety nets, adding that she will ask officials to submit reports on how the government plans to do so. The lawmakers' remarks came after a string of child-harm cases recently received widespread media coverage and nationwide attention. The cases include a 19-month-old toddler allegedly beaten to death by her mother and other relatives; a 12-year-old boy shown beaten in a video by his father for failing to bring home hot sauce with a meal he bought from a street stall; and a daycare center involved in physical abuse of toddlers under its care. According to the Ministry of Health and Welfare, it received 54,597 reports of child abuse in 2016 and 59,912 in 2017. Angela Wang (王薇君), a longtime advocate for abused children and chairwoman of the Taiwan Children's Rights Promotion Association, protested at the Legislative Yuan on Thursday along with several parents, demanding that lawmakers take action to protect children against abuse. She said her organization is organizing a mass protest to raise child abuse awareness. Meanwhile, three New Taipei City councilors held a press conference on Thursday in response to the recent high-profile child abuse cases. 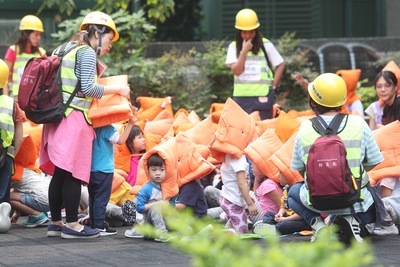 Councilor Chang Wei-chien (張維倩) said she hopes to set up a whistle-blowing mechanism to encourage teachers and employees at daycare centers and kindergartens in New Taipei to report any wrongdoings. Councilor Peng Jia-yun (彭佳芸) noted that the daycare center in New Taipei allegedly involved in physical abuse had an A rating, and said future rating systems should include the opinion of parents. Councilor Lin I-chi (林裔綺), meanwhile, suggested that the government set up a national platform to reveal the names of child-related institutions that have violated the law.